Peach pie is something I wouldn't be having in April had I not frozen some of the luscious organic peaches I got last summer. If you've been reading Delightful Repast for very long, you know I love peaches but refuse to buy the out-of-season imports no matter how much I'm craving a peach. Last July and August I enjoyed flavorful organic peaches every way I could think of -- peach pie, peach shortcake, peach jam, peach cobbler, peach crumble, just plain peaches. I imagined how wonderful it would be to have a peach pie in the middle of winter, so I froze them pie-ready. When I was young (decades ago! ), my parents had an apple tree. And one day when we were drowning in apples, my mother and I got the brilliant idea of freezing them pie-ready. We had four pie plates and we lined each with a big piece of foil, then stirred up four batches of apple pie filling and poured them into the foil-lined pie plates, folded the foil over the apples and set the pie plates in the freezer. Once the pie filling was frozen, we removed the foil-wrapped filling from the pie plates and stacked the tidy packages in the freezer. And repeated the procedure many times! So last August I did the same with peaches, but on a much smaller scale, of course. Then any time I wanted peach pie, I just stirred up some pie dough and got the pie filling out of the freezer. It's been wonderful, but now I'm down to the last two and it will probably be another fourteen weeks before I can get my hands on some really good peaches. Wish I'd frozen a couple more! If you're a peach pie aficionado like me, be sure to do this next peach season. 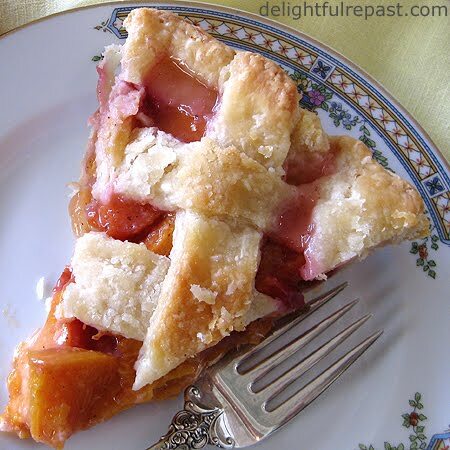 Here's the recipe for Peach Pie with Lattice Crust. And here's the pastry (below). Or try my Gluten-Free Pie Crust. Just scroll down for the recipe and double it for a two-crust pie. Well, you are an artist, so you have unusual thoughts sometimes! It IS delicious, you must try it! Goes beautifully with English Breakfast tea with a splash of milk. Ah, finally you get to the real health food! Now I can relate. Now I can empathize. Pie. Any kind of pie. Peach pie is pie-in-the-sky. My next book is going to be Life of Pie [sic]. Well, not sick. Healthy. Very, very healthy. I LOVE PIE! I especially love pie that has had time to marinate, a process aided by freezing. Trans: the sugary gloop fructifies, gets all soaked into the bottom crust and congeals into the ambrosia of gods for about a half inch right above it. Sounds like you've got it right with your careful selection of peaches as well. If you don't start with the right fruit, you are fatally compromised from the start. The really, really, really right fruit for me is black cherries. As in ba-da Bing. And then there is lemon meringue pie. True, lemons are not really there, but hey, it all breaks down into sugar anyway, right? So lemon meringue pies just have a head start on digestion. I am always happy to aid and abet a head start. 5 Cleavers for this excellent article, Jeani! Wow! This is my first 5-Cleaver Award! Funny you just mentioned black cherries. I just this minute returned from the health food store with a bottle of concentrated black cherry juice. I will eventually post my lemon meringue pie--just for you! I made my first home made crust last Thanksgiving for a pumpkin pie and I was astounded how good the crust was from store bought! I'll never go back. Your peach pie sounds so yummy, especially with a scoop of vanilla Ice cream. I can't wait to make it once the warmer mother earth brings us her fruits. That's so true. A homemade crust cannot be compared to store-bought. I hope people who rely heavily on convenience foods but do not need to (some people do) will try this and other "from-scratch" recipes in place of their store-bought alternatives and just see how much better they are. PS I usually go with the vanilla ice cream, but butter pecan goes really well with peach pie! Thank you! I hope you'll try the pie! Yes, I love Jane Austen too. I made my Sally Lunn Buns for a Jane Austen-themed afternoon tea. You can find them through this post, http://delightfulrepast.blogspot.com/2010/06/sally-lunn-buns-and-jane-austen-comfort.html, if you'd like to make them. A timely post for us down here as we reach the end of our stone fruit season. If only I had more freezer space! I know! I need a bigger freezer, but that's not going to happen any time soon! But even if you just make room for one or two, you'll get such a kick out of having a peach pie in the middle of winter. Sadly, in Arizona we don't get good local peaches. I miss being on the east coast where we had them in abundence. That's too bad. But I define "local" as "as close to home as possible." For you, that would be California and, possibly, Colorado. On the east coast, lots of places--I've heard New Jersey has fabulous peaches. That pie is killing me it looks so good. I was thinking about it hours after I saw the post. I also thought: what a good idea to save peaches not just for winter, but spring, too--it's when you really want a taste of something orchard-sweet! Mmmmmmm. Thanks, Wini! I've only got two left, so I'm giving careful thought as to when I'll bake them up. As you say, when I really want a taste of something orchard-sweet! Thanks, Ruth! Love a nice piece of pie and cup of tea while reading a book or watching a period drama! Prathima, thank you! I've long wanted to try my hand at some Indian dishes, and when I finally do, I'll try some of your recipes! I love this idea. My husband and I were talking about buying a freezer for our garage and freezing everything we could get our hands on this summer. I don't buy any fruit out of season in the US anymore and I do the same for vegetables (unless it's absolutely necessary for a recipe I'm featuring). I'm glad you like it. I may have to get another freezer some day. Don't you find that fruits and vegetables you've had to wait for (aaahh ... anticipation!) taste better? I love the idea of freezing peaches for future pies but I couldn't find the directions in your peach pie recipe. Do you just make the filling you offer and put it in a freezer container to thaw & put in a pie shell later? Then put a large piece of foil (large enough to cover the bottom of the pie plate and to cover the top) on the pie plate, pour in the peach filling, fold over the foil, set it on a level spot in your freezer. Once frozen, press the foil tightly around the frozen filling, crimp it closed and return it to the freezer. I was planning to keep some of them frozen for a very long time, so I put the foil-wrapped frozen filling inside a zip-lock freezer bag. I had a whole stack of them in my freezer! When you're ready to make a pie, there's no need to thaw the pie filling! Just put your bottom crust in the pie plate, unwrap the frozen filling and pop it in, put on the top crust and bake. May need to bake about 10 minutes longer than the unfrozen version. So 425 for 30 minutes, then 350 for 45 minutes. Just want you to know it works! Thank you so much. Thanks for letting me know! I know you'll enjoy peach pie in January just as much as I do!